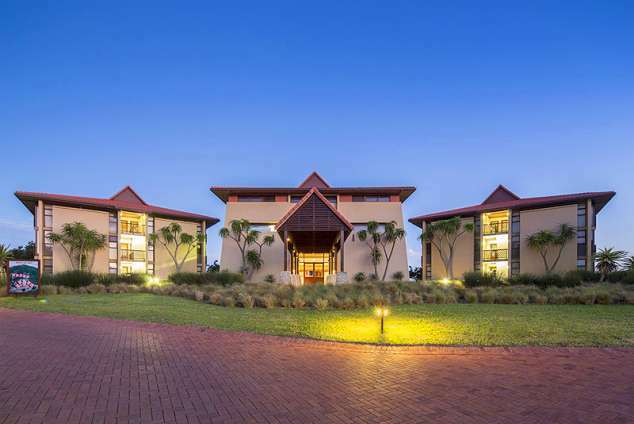 Ocean Reef Hotel - Zinkwazi Beach Accommodation. Situated on the Beach in the holiday village of Zinkwazi, at the Gateway to KZN's game reserves, yet close to Umhlanga and King Shaka Int. Airport. Rooms available are 4 x standard twin rooms, 14 x three bedroom apartments, 10 x two bedroom apartments and 1 penthouse with two bedrooms, all ensuite. Stunning views of the sea and surrounds. Surrounded by indigenous coastal dune lands and milkwood forests with access to the beach and lagoon via a private boardwalk. The hotel architectural ambiance reflects an Afro-Indonesian palette with neutral choice colour of rustic tones. The perfect venue for local and international holidaymakers and a stunning space for weddings and conferences. The Bamboo Room Food workshop food menu inspires the food flavours of Mediterranean influences by a diverse mix of seafood cooking techniques from various cultures. The kiddies menu is a delight. The conference venue accommodates up to 50 delegates with unique outdoor breakaways and numerous team building activities. 100 wedding guests can be accommodated in the bamboo restaurant. The areas is rich in activities with many golf courses, game reserves and heritage sites to visit, Zinkwazi beach is renowned for many water activities on the beach with deep sea fishing being unmatched. Take a walk along the kilometres of deserted beaches or watch the dolphins at play in the breakers at the close of day. Travel on the N2 - Northbound. Past Stanger - Travel for Approximately 10 km, Take next off-ramp - Darnall/Zinkwazi Beach. At the end of the off-ramp - turn right heading towards the Beach. Travel for approximately 5 kilometres you will reach Zinkwazi village. Turn Left into Flamingo Drive and then the next immediate left into Magai Drive where you will find yourself in front of the big brown gates of Ocean Reef Hotel, where our friendly STAFF await your arrival. 7898 page views since 19 Aug, 2015.